Into the third race of the 2010 NASCAR Sprint Cup, fans of the top stock car series have been treated to some unpredictable happenings in the first two events. The Shelby American 400 at Las Vegas Motor Speedway is the second non-restrictor plate race of the season and has the potential to help establish some firm ground under where the Sprint Cup teams stand for 2010. 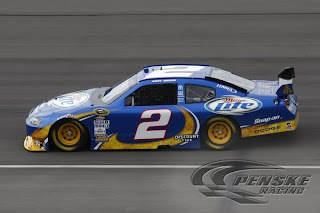 On Friday qualifying, Kurt Busch piloted has Miller Lite Dodge won the time trials for the Shelby 427 pole. Perhaps gaining some inspiration from the dominance of Penske Racing's IndyCar teams testing performances at Birmingham's Barber Motorsports Park, Busch shot around the 1.5 mile oval at an average speed of 188.719 miles per hour striping the #24 of Jeff Gordon from the top position. Scoring pole in his hometown race, the elder Busch brother will likely enjoy a repeat result from last season when Kyle Busch's won from the pole. With Dupont/Pepsi Max #24 Chevrolet nailing down a tough mark to beat for Busch, Gordon was little more than 1/100th of a second short of successfully holding off Busch's fast Dodge. In 3rd, Ryan Newman has ridden his Tornados-sponsored #39 Chevrolet attempting to fight the turbulence of an unfair 2010 campaign so far. Falling victim to a last race crash at the Daytona 500 and an engine failure at Auto Club Speedway, Newman currently sits 36th in driver points. Dale Earnhardt Jr took the top spot early in the qualifying session for the second time of the year. As qualifying concluded, Earnhardt Jr's #88 Chevrolet settled into a 4th place starting position for Sunday's event. JR Nation fans wanting to see a turnaround for the #88 Hendrick Motorsport car in 2010 will be pleased to learn this weekend's qualifying effort through Earnhardt Jr's average start of 28.6 place in the past four visits to Las Vegas. In 5th and 6th, the 2 of the 3 Joe Gibbs Racing teammate Kyle Busch and Joey Logano can present a definite challenge to the lead at Las Vegas. With Kyle Busch the reigning race winner in the #18 Toyota, Logano has been showing some real promise through the early stages of the 2010 Sprint Cup campaign seated 9th in points. Rounding out the top 10 in Friday's qualifying is the highest-starting Ford of Greg Biffle, the #5 Chevrolet of Mark Martin, Tony Stewart and Juan Pablo Montoya. Despite the aggressive performance that the Earnhardt-Childress Engine program has in the first two races of 2010, Montoya's #42 Target Chevrolet placement of 10th was the fastest of the group at Las Vegas Motor Speedway. Current Sprint Cup points leader and fellow Earnhardt-Childress Engine runner Kevin Harvick could only muster a 34th place starting spot for Sunday's Shelby American 400 race. In the middle of the field, multiple race winners Jeff Burton and Jimmie Johnson will be starting the event with not only their experience but with statistics on their side. Through the past 12 Sprint Cup races at Las Vegas Motor Speedway, the winner came from a starting position outside of the top 15 on 6 occasions. Four of those times became from between 23rd to 25st place. With two 500 mile races launching the 2010 NASCAR Sprint Cup season, the 400 miles around Las Vegas Motor Speedway might seem like a breather to the drivers and teams. However, these shorter races basically compresses the intensity level of the competitors as fewer laps mean a more flat-out race. These shorter events for the NASCAR Sprint Cup series also leaves less margin of error making even one pit road penalty a considerably more costly occurrence.